THE FIFA World Cup mascot for this year’s tournament is coming to Stratford-upon-Avon tomorrow (Wednesday). Residents will be able to meet Fuleco, the Brazil 2014 mascot, at the Shakespeare Birthplace Trust in Henley Street between 3.30pm and 4.30pm. As well as having their photo taken with the mascot, there’s a chance for locals to test their shooting in order to win official World Cup merchandise. 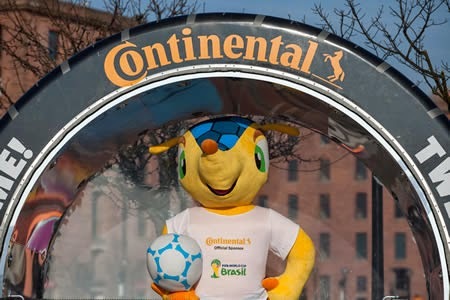 Fuleco is being taken on a road trip round the country by official sponsors, Continental Tyres. The company are also giving away a pair of tickets to the World Cup Final in Brazil, including flights and accommodation. The Continental roadshow was launched by former England striker Robbie Fowler in Liverpool on 11th March. Over seven weeks it will visit hundreds of locations across England and give tens of thousands of fans the chance to get involved. The mascot will also be at Warwick University between 10.30am-11.30am, and Protyre on Emscote Road, Warwick, between 1.30pm and 2.30pm.